The Far West has an advanced business network that fosters growth and prosperity in the region. The following information will advantage both new and experienced professionals and businesses. For more information don’t hesitate to contact us. RDA Far West (RDA FW) is a Commonwealth funded not-for-profit organisation working towards economic diversity and the long term sustainability of the Far West region of New South Wales. The organisation is overseen by a committee of dedicated local leaders who possess a wide variety of professional skills and experience. The organisation works in partnership with governments, local communities and other stakeholders to develop initiatives that enable the Far West to grow sustainably. 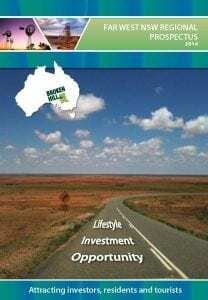 RDA FW is the leading economic development agency in the most dynamic and diverse region of Australia. Established in 2009, RDA FW leads the way in strengthening the Far West as a competitive and modern regional centre of excellence. It does this by securing funds for regionally significant infrastructure projects; providing effective connectivity between industry, education and the wider region economy; and by driving investment in the Far West. Renew the Far West NSW is a social enterprise designed to catalyse community renewal, economic development, the arts and creative industries across the Far West. With the aim of bringing activity to the regions empty properties, the project endeavors to broker temporary access to empty shops, offices, commercial and public buildings, allowing arts projects, creative retail enterprise or community activities to flourish. The Foundation Broken Hill model is a credible, sustainable community capital fund that specifically facilitates employment opportunities as well as encouraging social development. The local model is a sustainability project that has been designed specifically for Broken Hill, with a focus on encouraging the expansion and development of business, social and educational projects that will provide new job opportunities. The objective is to support Broken Hill to have an optimistic outlook based on a diverse, strong economic base. The Central Darling Shire Council is a vibrant area encompassing vast lands, rich heritage and diverse culture. The shire incorporates the towns of Wilcannia, Menindee, Ivanhoe and White Cliffs. All of which are unique towns with great historic value, close to beautiful national parks, wetlands, opal mining, agricultural and tourism opportunities. It’s the largest Shire in New South Wales, yet has the smallest population with less than 2000 people. Our vision – Broken Hill will be a vibrant, prosperous and culturally rich Heritage City shared with visitors from around the world. Council will provide high quality services and leadership to enhance community living and facilitate a prosperous economy. Council currently employs 190 full time, part time and casual employees who provide more than 200 services and manage assets of $236M across a number of complex areas to provide for a wide range of community needs. It works closely with its partners, business, industry and each tier of government to ensure that the City has a sustainable future. The Broken Hill Chamber of Commerce is a membership-based organisation serving the business and industry interests of Far West NSW, Australia. The Chamber also partners with the NSW Government to deliver the Small Biz Connect business advisory service to all businesses based in the Broken Hill, Central Darling and Unincorporated Local Government Areas.